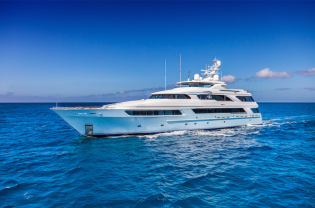 50m (164’) charter Yacht VICTORIA DEL MAR available for Caribbean and Bahamas yacht holidays – Superyachts News, Luxury Yachts, Charter & Yachts for Sale. 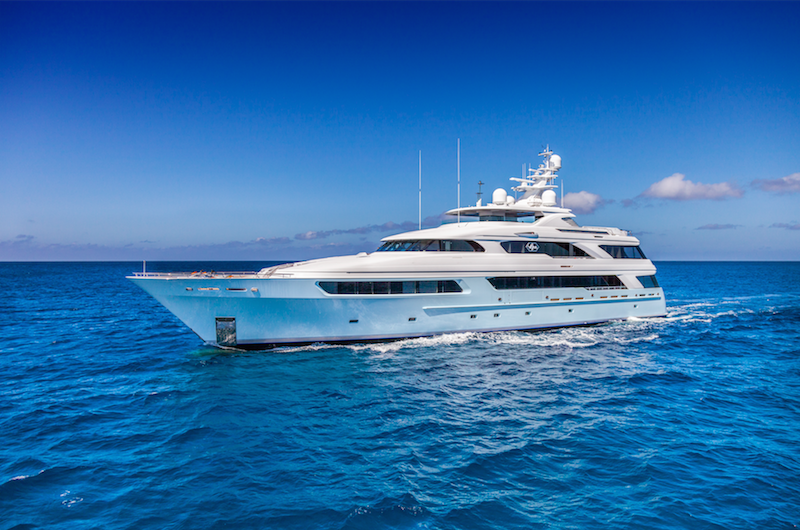 Following her comprehensive interior refit and system upgrade, the 50m (164ft) Delta Marine motor yacht Victoria Del Mar (ex Happy Days) has successfully concluded her debut Mediterranean yacht charter season. Charter yacht VICTORIA DEL MAR is now available for Bahamas yacht holidays as well as Caribbean yacht vacations during the winter 2014/2015 boat rental season. Launched in 2006 from Delta Marine in Seattle, Washington as Happy Days, superyacht Victoria del Mar holds the distinction of being one of the most voluminous yachts in her size range. Her current owners worked closely with design firm Claudette Bonville Associates of Fort Lauderdale, Florida, to create a contemporary and distinctive interior inspired by the work of the late Alberto Pinto. Within her 7,500sqft interior, motor yacht Victoria del Mar features a guest gym and twin VIP staterooms forward on her main deck. These staterooms boast 8ft ceilings with skylights above the queen-size beds, walk-in dressing rooms, and large en suites. The master suite comprises the majority of the owner’s deck and features a spacious skylounge that is separated from the wheelhouse by stunning artistically etched slump glass doors. While the skylounge features mirror balconies that open to the sea, the master itself spans the yacht’s 34ft beam and features an expansive en suite as well as a large dining and lounging terrace that can be enclosed or opened to the sea breeze. Four further staterooms, two twins and two queens that round out her guest accommodations for 12 in 7 staterooms, are situated on the lower deck and easily accessed by the main stairs or guest elevator. All staterooms are equipped with the latest in mini iPad-controlled high definition audio/visual technology and feature embroidered Italian linens, leather paneling and sumptuous carpeting. A large spa pool, dining table for 18, teak-topped bar and 100in outdoor screen makes the sun deck a coveted spot for cocktails, al fresco dinners and movies under the stars. Equipped with a 32ft Century tender and 22ft Nautica RIB jet tender, Victoria del Mar yacht boasts an array of water toys to delight every enthusiast, from SeaDoo waverunners to Sea Bobs, inflatable kayaks and paddle boards, to towed toys, water skis and a DJI Phantom 2 Vision GPS Drone. Uniquely, charter yacht Victoria del Mar offers personal concierge service to each charter client. The luxury concierge works with the client from the initial inquiry through the end of the charter and arranges all manner of services, from on shore dining and entertainment reservations, to private tours, VIP events and special onboard celebrations. Luxury yacht Victoria del Mar is serviced by 11 highly experienced, friendly and professional crew, among them certified RYA small craft, PADI, dive and yoga instructors. Languages spoken aboard include English, Dutch, French, Afrikaans, Spanish, Portuguese and Italian. The talented Chef Jasper Somers received his training in the techniques of classic French cooking at The Hague’s Academy of Culinary Arts and boasts a variety of dishes, with a focus on light, healthy and Mediterranean inspired cuisine. Bahamas and Caribbean yacht holidays are an ideal way of spending your free time with family, friends or even business partners and colleagues. You can be sure the recharge your batteries completely, enjoying the pristine clear waters, beautiful beaches and warm breeze of one of the most popular yacht rental destination around the world. There is something for everyone on a Bahamas superyacht charter, whether you prefer to stay away from the crowds or be entertained by happy tourists and colourful local people to the beat of a vibrant music and night life. The Bahamas is made up of over 700 islands and islets and a total of 2400 cays; there are certainly plenty of destinations to choose from to enjoy some fantastic diving and snorkelling or engage in the many water sports activities organised by your Captain and the crew. A Caribbean yacht holiday itinerary usually includes such popular destinations as Antigua, St Barts, Anguilla, St Martin, The British Virgin Islands, The US Virgin Islands or the Grenadines, as well as many, many other fantastic places; such secluded bays, breathtaking islands and cays, as well as thriving bars and fantastic Caribbean nightlife. For shopping you could visit the Gustavia Harbour in St Barts, for history and harbour beauty visit Nelson in Dockyards in Antigua, watch the amazing sunset in St Lucia or enjoy the magnificent views from Brimstone Hill Fortress in St Kitts. There are endless options to choose from when it comes to cruising this area on your chosen Caribbean charter yacht.